Healthy popsicles are enjoyable for both kids and adults on a hot summer day. 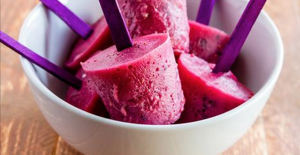 With healthy popsicles, you don’t have to give up taste for something light and refreshing. These cool treats became iconic of summer, but can be enjoyed year-round when you need a little refreshing snack. Most grocery store popsicles are sugar-laden and expensive. These popsicles have unnecessary high fructose corn syrup and other ingredients you don’t want your kids to eat. High fructose corn syrup and other processed sugars cause weight gain and imbalance body chemistry. The solution to having delicious and healthy popsicles is to make them yourself. Here are just some ways to make healthy popsicles your kids will love to eat. Popsicles don’t have to be made from complicated recipes that feature many ingredients. One simple, delicious way to make popsicles is to squeeze the juice from fruit you already have on hand. This is a great solution to use fruit before it goes bad. Freshly squeezed orange or lime juice is especially refreshing. If you don’t have freshly squeezed juice on hand, you can always use the bottled orange juice already found in your fridge. Just pour the juice into popsicle molds, cover with cling wrap or aluminum foil, insert popsicle sticks into the molds, and place in the freezer. Dairy-based popsicles can be especially refreshing and delicious. While there are many, many recipes online for delicious dairy-based popsicles, our favorite includes the use of Greek yogurt. Greek yogurt has additional protein for energy and often contains less sugar. Mix Greek yogurt with fresh berries in a blender, adding honey to taste. Freeze mixture into your favorite popsicle molds, and enjoy this delicious summer treat. Since you are making the popsicles yourself, go ahead and experiment. You may find new combinations that include fresh herbs and seasonings that your kids love. For families that enjoy the heat, consider making spicier, savory popsicles that infuse a little spice, such as cayenne, into the mix. Before you put any of these popsicles into the freezer, drop fresh fruit pieces into the molds. These pieces freeze in the middle of the popsicles and are a delicious twist on traditional popsicles. Berries and grapes are particularly tasty when frozen inside of popsicles. If you’re looking for ways to incorporate more fresh vegetables into your children’s diet, purée vegetables like butternut squash and spinach to mix into your homemade popsicle recipes. Often these ingredients are mild enough to not impart too much flavor, while still maintaining much of the nutritional advantages they provide. If you’re committed to a healthier lifestyle and love using healthy ideas such as homemade popsicles, contact us today for a consultation on how we can help take your nutritional plans to a new level.